The Dublin 7s festival takes place this Saturday May 11th at Old Belvedere Rugby Club and promises to be a fun filled day. 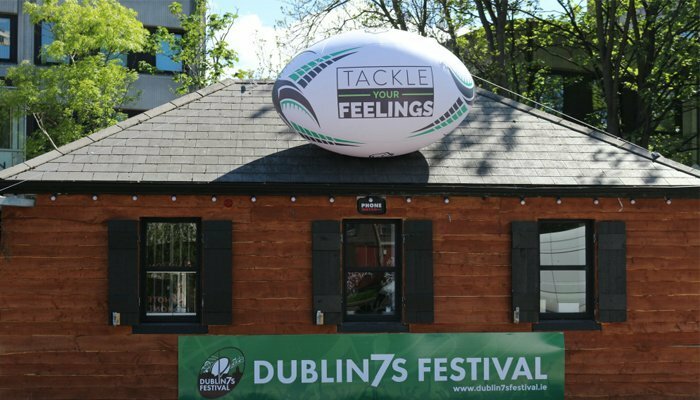 To celebrate our collaboration with the Dublin 7s festival which takes place this weekend, the Tackle Your Feelings (TYF) team will take over the Lock 6 Cafe in Grand Canal, Dublin, opposite the Barge, this Friday from 8am to 3.30pm. This event sees the Tackle Your Feelings Café come to life, in a fun and engaging way. Customers will be able to test their tackle strength on 'The Beast' tackle machine and grab a free TYF cupcake with their coffee and maybe meet a rugby player or two. The Dublin 7s Festival combines rugby and live music to create an incredible day for participants and spectators alike The rugby tournament will run throughout the day, starting at 9.30AM, and finishing with the Men's Elite Final that evening. Live music will be provided by the iconic boy-band, 5IVE; as well as 90's sensation, Smash Hits until 1AM. Outdoor bars will be prevalent on the grounds, helping revellers to kick off the summer in style.